The plotline of the game is simple. Montgomery Burns, realizing the Simpsons have ruined his life on numerous occasions, decides to kill off the entire family. Giving them a vacation around the world, he sends them to China, Antarctica, Egypt and finally Hollywood. Every location features a member of the Burns family (Fu Manchu Burns, the Abominable Snow Burns, Ramses Burns of Egypt, and Eric Von Burns the Hollywood director) who attempts to kill the family. 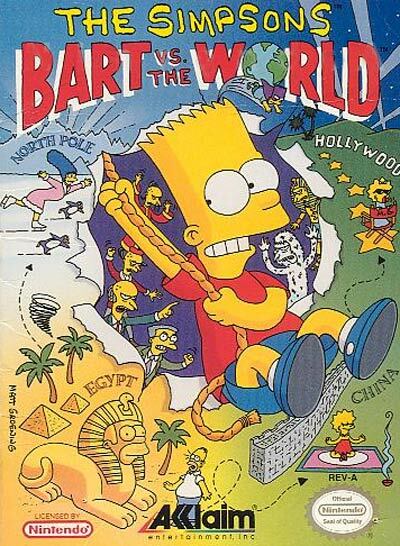 You play as Bart through the adventures until you defeat the boss at the end of the level in side-scrolling gameplay similar to many 2D titles from the same gaming era. Each level also features sub games such as Concentration, a Slot Machine and a Simpsons trivia challenge that give the player extra points and lives.